Think Act Vote (? !X) a radical think tank that explores the new and creative ways we can and are shaping our future lives and communities. We are disrupting the traditional model of a think tank because we believe that every single one of us, no matter what age, background, religion, ethnicity or occupation has personal experiences and ideas to share that can lead us to a brighter future. We made this manifesto. Run by a powerhouse of volunteers and a vibrant community of collaborators and supporters, Think Act Vote (? !X) spent a couple of years asking thousands of individuals to think deeply about, and to believe in a future that they choose. Throughout this journey we met some truly incredible people and heard thousands of dreams and fears about the future. We have been sharing these online through our Futures Interviews and creative activism projects, but we really don’t want the stories to be lost in the digital archive. And so, to capture some of this inspiration we made this collaborative book. 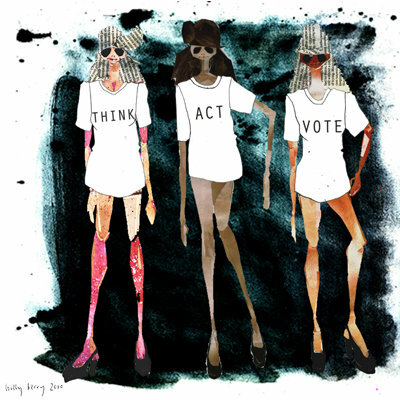 Think Act Vote coined the term, Creative Activism: the act of making something through art, media or life to create awareness of and engagement with important issues of our time to inspire a brighter future. As a way to initiate a new and creative conversation about politics and daily life, Amisha Ghadiali set up Think Act Vote (? !X) in election year 2010. It all started from a conversation with friends who joined together in their frustration about politics who saw that when you flip an election on its head, it’s really just about choosing a future. And with that Think Act Vote (? !X) was founded and immediately set out to playfully ask people that very question; What is the Future You Choose? We started with a ballet box and asked hundreds of people to think about and vote for the future they choose. The most powerful of these futures have recently been visualised by over fifty amazing illustrators – we shared these illustrations every week of 2012 in our online Futures Calendar. We ran a t-shirt design competition, judged by an esteemed creative panel, including Fashion Designer Katharine Hamnett, Social Entrepreneur Cyndi Rhoades and Stylish Illustrator Daisy de Villeneuve, and the winning design by Jesson Yip was lovingly made into t-shirts by ethical fashion superstars, Komodo. We then ran an event called ? !X Refashioned that saw leading ethical fashion designers Tara Starlet, Ada Zandtion, Beautiful Soul, Junky Styling and others design a one off piece and customisations for any one to do at home. And, with our travelling photobooth we’ve travelled to events and festivals across the country, including Vintage Goodwood and Latitude Festival and snapped hundreds of people in the ? !X t-shirts. In 2011 we launched our Futures Interviews series, asking people to share their chosen futures and some of the ways we can think, act and vote to create them. We didn’t want this wisdom to be lost in a digital archive. We wanted to pause for a moment and capture some of the best responses we’ve had in a book, all about the future. In the book, insightful interview responses and stories are presented alongside the work of visual artists, designers, illustrators and photographers. Follow the journey – watch our Slideshow from back when we started – What’s This All About Then?